An MRI study revealed marked T2 hypointensity consistent with susceptibility effect involving the putamen, head of the caudate, posterior thalami, and dentate nuclei compatible with iron deposition. In addition, some minimal iron deposition was detected within the cerebral and cerebellar cortices. Iron plays a crucial role in the formation of toxic oxygen radicals. Excess iron functions as a potent catalyst of biologic oxidation. Homeostatic mechanisms are utilized to maintain appropriate serum iron concentrations, thus preventing neuronal cell damage from ironmediated free radicals. Several hereditary disorders, including aceruloplasminemia, can disrupt this homeostasis. Ceruloplasmin is an α2glycoprotein synthesized in hepatocytes that binds plasma copper and has ferroxidase activity. 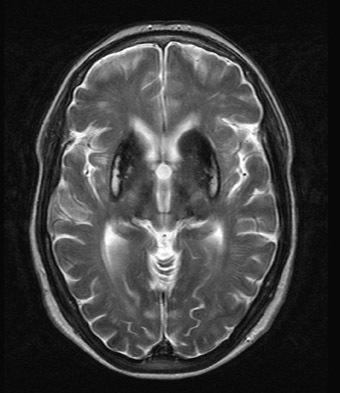 Aceruloplasminemia is an autosomal recessive disorder characterized by abnormal deposition of iron in the brain, resulting in progressive neurological dysfunction. Abnormal deposition of iron and/or other paramagnetic elements in the CNS also occurs in other hereditary disorders such as hemochromatosis, Hallervorden-Spatz syndrome, and Wilson’s disease. 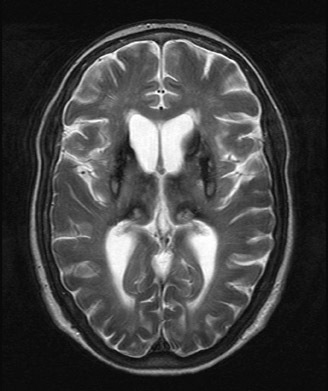 Aceruloplasminemia has unique involvement of the CNS compared with the aforementioned disorders that can be demonstrated with MRI. Bosio S, De Gobbi M, Roetto A, et al. Anemia and iron overload due to compound heterozygosity for novel ceruloplasmin mutations. Blood. 2002;100:22462248. Grisoli M, Piperno A, Chiapparini L, et al. 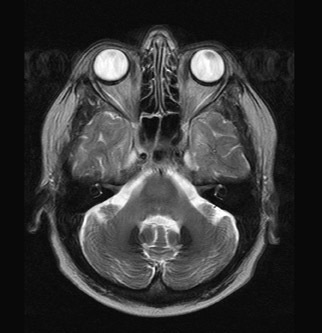 MR imaging of cerebral cortical involvement in aceruloplasminemia. AJNR Am J Neuradiol. 2005;26: 657661. Ponka P. Hereditary causes of disturbed iron homeostasis in the central nervous system. Ann of the New York Academy of Sciences. 2004;1012: 267281. Xu X, Pin S, Gathinji M, et al. Aceruloplasminemia: an inherited neurodegenerative disease with impairment of iron homeostasis. Annals of the New York Academy of Science.s 2004;1012:299305. Miyajima H, Takahashi Y, Kono S. Aceruloplasminemia, an inherited disorder of iron metabolism. Biometals. 2003;16:205213. Miyajima H, Kono S, Takahashi Y, Sugimoto M. Increased lipid peroxidation and mitochondrial dysfunction in aceruloplasminemia brains. Blood, Cells, Molecules and Diseases 2002;29:433438. Kaneko K, Yoshida K, Arima K, et al. Astrocytic deformity and globular structures are characteristic of the brain of patients with aceruloplasminemia. Journal of Neuropathology and Experimental Neurology 2002;61:10691077. Miyajima H. Aceruloplasminemia, an iron metabolic disorder. Neuropathology 2003;23:345350.